This demi-lune console table is a particularly good example of the fine, early Dutch marquetry from about 1780, with its foliate scrolls, butterflies and urns. Marquetry is the method of decorating the surface of furniture with a panel of veneers. The sheets of veneer are temporarily glued together into a “pack”, and cut with a fine saw, producing contrasting panels of identical design. Simple geometric marquetry designs are often called ‘parquetry,’ in reference to the similar patterning of parquet flooring. Woods used were usually the more exotic timbers such as ebony, rosewood or boxwood, and sometimes included ivory, tortoiseshell, mother-of-pearl or fine metals. Some were dyed, and portions of the design, for example the leaves, were shaded by scorching the edges in hot sand. Marquetry should not be confused with inlay, in which pieces of wood are let in to the solid carcass. 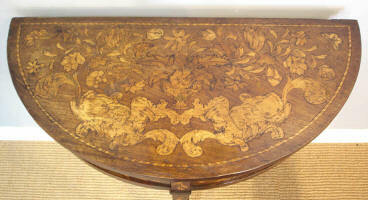 Marquetry was introduced into English furniture at the restoration of Charles II in 1660 by Dutch immigrant “inlayers”. At the end of the 17th Century, a new influx of French Huguenot craftsmen, known as “ebenistes”, popularised seaweed or “arabesque” marquetry. The technique was revived again around 1765, when formal neo-classical designs became popular in Adam and Sheraton style furniture. The Dutch were particularly skilled at marquetry, and in their own country soon developed a distinctive style of exotic foliate designs covering all surfaces of the piece, including legs. Typical of their style is the truncated leaf, where the tip seems to disappear as it curls.